Putting up a shelf, fixing a squeaky door or even building a birdhouse for a loved one (is that a thing?) can be daunting tasks. That's why smartphone apps like TaskRabbit and numerous handyman websites have seen much success of late but there's nothing quite like finishing a job with your own fleshy digits. With the best tools for beginners, and a bit of willpower, you can do it (yourself). Having the right tools is a good starting point for DIY, because it's almost impossible to put up a shelf with just a screwdriver – and believe me, I tried. A little up-front investment will act as the perfect springboard to more audacious DIY projects. I've collated what I believe to be some of the best and most affordable tools for absolute beginners, ranging from idiot-proof cordless drills to the easiest measuring devices and more. You want quality toolage at reasonable prices, and that's what I've put together here. While, as a starter or very occasional DIYer you probably don't need to invest in utility belts, blue overalls or a welding mask. However, as well as the essentials listed here, you should definitely get eye protection and some disposable dust masks. Basic ear defence in the form of the best ear plugs may also be advisable for some. You should also get the non-electric classics: hammer, electrical screwdriver, multi-head screwdriver, pliers, needle nose pliers and either a small vice or a Workmate, depending on how much engineering you plan to carry out. As wide-ranging a set of screwdriver bits as possible is also highly advisable, in my experience. And a spirit level, of course, unless you like your shelves to double as slides. Admittedly, it is slightly controversial to include a corded drill in a list of tools for beginners but bear with me. There are plenty of folk out there that would love to tackle a simple DIY drilling task at home but refrain through fear of punching a hole in a water pipe or accidentally felling the partition wall between the downstairs loo and the living room. That's why Bosch has created this extremely approachable Easyimpact compact drill that's lightweight, easy to handle and comes kitted out with a handy assistant that sets the exact drilling depth and helps collect excess dust and debris in a small container. 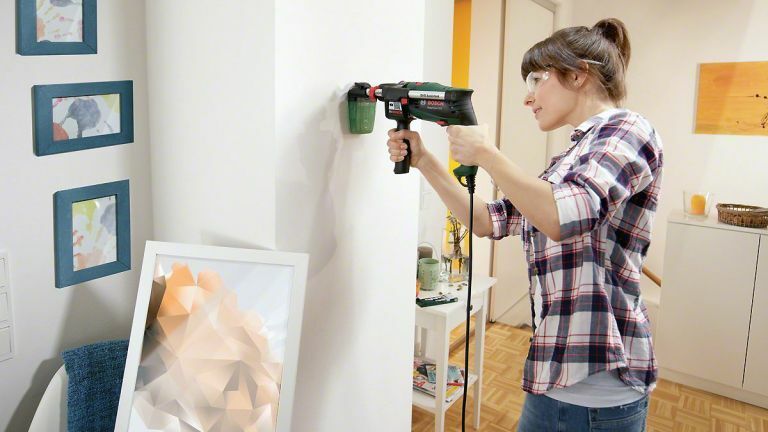 A good impact drill is a solid investment for anyone looking to tackle a huge variety of DIY tasks, especially if you live in a 20th century house where the walls aren't made of plasterboard. Pair this with a decent drill bit set and you'll be set to create holes for many years to come, without spending very much at all. Assembling flat-pack furniture is one of the most common DIY tasks around the home, as well as one of the most hated. The best way to speed up the process is to invest in an electric screwdriver, which takes the strain out of annoying assembly tasks and saves the guaranteed repetitive strain injury Ikea always fails to mention. Where more bulky electric screwdrivers tend to come unstuck when tackling particularly fiddly tasks, this forward thinking model from Worx incorporates a neat extending shaft for those really tricky spots. Also, there's and LED lamp for illuminating tight spaces and an auto spindle lock for manually applying torque. The cordless multi-tool is the electric Swiss Army knife of the DIY world, able to sand, cut, trim and scrape thanks to myriad attachments. Its main use is in the kitchen and bathroom, where a multi-tool can cut out shelves, plastic piping and more, in situations that would normally require you to dismantle the whole damn room. I've used multi-tools to do everything from chopping out oven shelves in order to fit a larger oven, to trimming the excess off a dishwasher footboard. They are a life saver. Seeing as you're just getting started, it's really not worth splashing out on tools, so it's worth saving the dollar and checking out what cheap-as-chips Am-Tech has to offer. This highly portable, battery-powered tool weighs just 798g but packs a relatively potent Lithium-ion battery pack for cutting, scraping and sanding on the move. The 50W power output is way down on more expensive rivals but it is capable of dealing with most common tasks and features six variable speed settings for greater control. The battery packs can be charged in under an hour, while the kit comes with a useful selection of accessories to tackle the most common jobs, and is compatible for use with other Am-Tech multi tool accessories, as well as those from most of the big brands. There's an old DIYer's saying: "Measure once, shame on you. Measure twice, you won't do measurements again." Something like that. Profound words, anyway. It's advice that's ignored up and down the country during every drizzly bank holiday weekend, leading to some seriously mismatched shelves, wasted wood, and an awful lot of blaspheming. But all that can be avoided with some handy gadgetry. This little laser measure from Bosch couldn't be simpler to use, as just one button kicks off proceedings, firing a laser line out of the top of the unit to offer an accurate distance measurement. Take some of the blood, sweat and tears out of painful sanding tasks with this powerful 280W orbital sander, which features variable speed adjustment between 7000-12,000rpm and a vacuum dust extraction port that can be rotated 360° to keep work spaces clean. The great starter package comes with three mesh sanding discs of various grits, a dust bag and a dust extraction port adaptor, should you get bitten by the sanding bug. A simple hook and loop backing pad system (a bit like Velcro) makes for a quick and easy change of sanding discs, as well as widespread compatibility with most orbital sanding discs, available to buy from your friendly, neighbourhood DIY shop.